top copy. RARE FIRST PRESS. 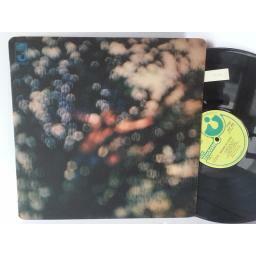 PINK FLOYD obscured by clouds, SHSP 4020. 1972 UK first Press. "GRAMOPHONE CO" on rim. EMI harvest records, stereo. Sleeve is in EXCELLENT condition LOOKS NEW, HAS A SUPER "La VALLEE PINK FLOYD" HYPER STICKER TOP RIGHT. Vinyl is in EXCELLENT condition, LOOKS UNPLAYED, BEST COPY I HAVE SEEN, Minor background noise in places. I do not sell records that are warped or jump. All records will be posted with extra card stiffeners. If you feel the record is not as described I will give a full refund.